Long time readers will know that a lot of bubbles have tickled a lot of noses here at the Manse. Mrs. E. just love pop, fizz, bubbly, shampoo, sparkling, call it what you will. I confess a deep delight in a glass of the stuff at brunches, luncheons and dinners. It was my standby in college when I didn’t know what to serve (or order) with dinner. There was a time when Friday’s called for either a martini with the guys or a bottle of Champagne with a date. Better Friday’s saw both. 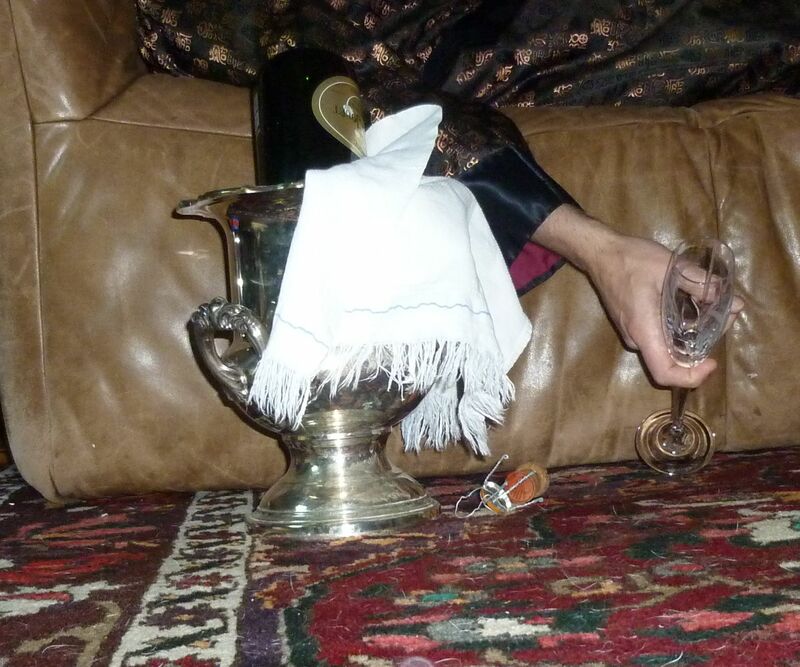 I was in the habit of splashing out in those days, and my wine etiquette was lacking at best. Since I have learned to never fill a glass more than half full, but to fill it often, and to not top off a glass of bubble until there is no more than a sip left in the flute. And yes, you may fill a flute closer to the top. But my most egregious faux pas, the one that branded me as a neophyte and no competition for the gentlemen, was my habit of placing an empty bottle of Champagne back into the bucket upside down. I thought it was a natural signal to the waiter to bring another as things were looking dry. I can only imagine the gritted teeth of the sommelier as I insulted both my guests and the noble bottle. At least I never snapped my fingers. My waiter friends would have dragged me through the kitchen door to explain why I should never have done that. So, please, dear readers, the empty bottle goes back into the bucket in the usual manner. And while I’m on the subject, when at home, use the towel to wipe the water from the bottle, not to wrap it. After all, you’re not selling Dom Perignon and pouring Korbel. Finally, pouring from the punt (that indentation at the bottom of the bottle) is snazzy, but unneccessary. Hold the bottle by the base, pour and give it a slight twist to stop the drip. Wait for the bubbles to recede and fill the glass. This entry was posted in Elegantology, Entertaining and tagged Champagne etiquette, Dom Perignon, Korbel. Bookmark the permalink. On weekend mornings when I complain about awakening with cottoned mouth and temples throbbing, my seven and four year old boys love loudly quipping “there’s no pain like Champagne.” Mrs. A and I average two cases monthly. It is the most food friendly beverage besides water – and what’s the fun of drinking water unless you cut it with a little Whisky? I’m off to Charleston and yes, my “luggage” will consist of several bottles of bubble. Cheers! I adore champagne – I must do a post one of these days on our tour of the caves! That picture is me yesterday. Oy. Good to know on the etiquette. While never having put the bottle back in upside down (I just didn’t want the remnants to dribble into the bucket), I have seen it done at other tables, on the few occasions I’ve had to order champagne, such as Mother’s Day coming up. The bottle upside down in the bucket… I think we got this from movies, don’t you. I think that’s the only place I’ve ever seen that done. In our house, Champagne is usually in Mimosas for the ladies. I love it at Christmas and Thanksgiving – but that’s where it end. I’m determined to land in Cape Cod this summer – I’d love to have a bottle of Champagne and a crystal flute – sipping while strolling the beach in the very late evening in white slacks, no shoes and unbuttoned shirt. I love a good bottle of plonk and platter of oysters. is that you tell it like it is!!! In my house, champagne is called Martinelli’s. I can tell you from experience that a bath in the bubbly to celebrate a victory is a lot less pleasant when you don’t drink. Best picture you have published yet. I’m hoping that picture will be me next week after exams. A little Latin and a lot of Rousseau are all that stand between me and the bubbly. Oh the things to look forward to! I love chamapagne!! Your post really made me smile!! Splash out ladies and gentlemen! Brohammas, not the Blenheims? A “bubble” bath is actually rather painful and not recommended. Besides, it’s alcohol abuse. Quite a waste. Paul, not sure where it came from. Not to disparage, I figured it for some sort of Russian tradition. Trey, that’s what I call packing light. Ms. Finberg, thank you. As I say, this is a quest. I’m far from perfect. Turling, I pictured a hammock in that garden of yours. Lovely stuff….wish I could afford it more often. Personal favorite (as well as Churchill’s): Pol Roger. Personal pet peeve: it’s only Champagne if it is ACTUALLY Champagne. If it isn’t made there it isn’t Champagne, it’s sparkling wine. I might recommend Domaine St. Hilaire as an inexpensive substitute. It’s French, made in the methode champenoise, and is inexpensive!!! Hello Mr. Horning, of course you’re correct. The bottle in the bucket is Perrier Jouet. I too love Pol Roger and them all frankly. St. Hilaire was Thomas Jefferson’s house sparkler and he died with I don’t know how many cases in the basement and an unpaid bill… I’m also partial to Cava, which can be quite the bargain, too. The best part about Champagne is that it allows us to use beautiful glasses that would otherwise sit in the cupboard. We have traditional flutes, a treasured wedding gift of almost 30 years ago, but I also splurged on William Yeoward’s Fern etched flutes. They are the most gorgeous stemware on the planet in my mind. We always kick off Thanksgiving and Christmas Eve with Champagne, but it is also a must at an Easter brunch, all of the christening parties, and special birthdays, and served at an ‘At Home’ about 4 p.m. on New Year’s Eve (we celebrate early and wrap up early on NYE). Celebrations are important and give life meaning. The late tastemaker Lee Bailey recommended always keeping a good bottle in a prominent place in the refrigerator. It inspires us to drink more of it, and it is chilled when you need it–on a moment’s notice. Cheers to Spring! P.S. The bucket in your photo is impressive–looks like it could double as a golf trophy if you need to impress someone (or clobber an intruder at night?). Paula, it doubles as a watering can for the house plants. Hate to waste the ice melt. E+J, what a pleasant surprise! Thanks for dropping by. WIsh I could claim the spread as my own. Ah, looks so comfortable and, which I am sure you are, in your silk? robe…”The easy life…”.